Today I’m going to share a yummy dessert that a sweet friend of mine from New Zealand sent me. She reads my blog and offered me the opportunity to share this iconic New Zealand dessert with my readers. Pavlova is a meringue-based dessert with a crisp crust and soft, light inside and it’s named after the Russian ballet dancer Anna Pavlova.The dessert is believed to have been created in honor of the dancer either during or after one of her tours to Australia and New Zealand in the 1920s. The nationality of its creator has been a source of argument between the two nations for many years, but formal research indicates New Zealand as the source. My dear friend said that one of her favorite chefs is Annabel Langbein and shared her Pavlova recipe for us to enjoy. To make a pavlova you really need an electric beater and egg whites that are not too fresh. Heat the oven to 180°C. Line a baking tray with baking paper and mark a circle about 16cm diameter with a plate. Place the egg whites into the clean bowl of an electric beater. Add the salt and beat until stiff. Slowly add the sugar with the beater running. Beat for about 10 minutes at high speed until the meringue is thick and glossy – it should be thick enough not to fall from the beater. Last of all, whisk in the corn flour and vinegar. Use a big spoon to drop dollops of meringue into the circled area of baking paper. Form into a circle of meringue, making swirls with the spoon on the top rather than flattening to a neat tidy disc. Bake at 180°C (not fan bake) for 5 minutes then reduce oven temperature to 130°C and cook a further hour. Turn off oven and leave pavlova to cool in the oven. 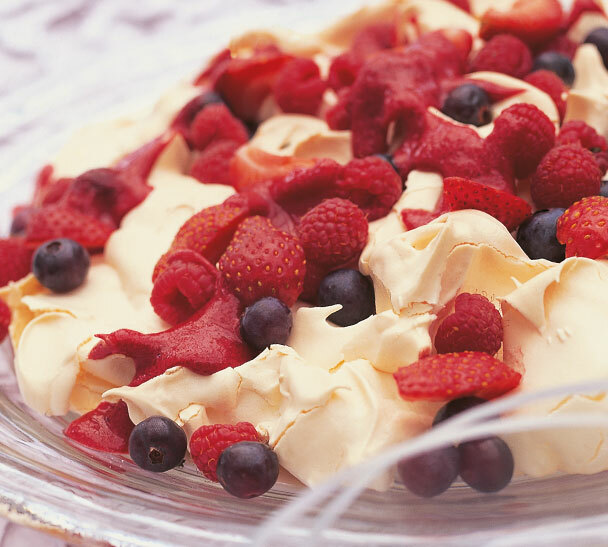 Pavlova can be cooked a couple of days ahead and stored in an airtight container, or frozen. To serve, spoon Berry Compote over pavlova and scatter over mixed berries. For those of us not completely familiar with Celsius or other New Zealand measurements you can view a more Americanized version of the recipe here.